Discover Lansdale will help support Life in Motion through community growth by creating opportunities for a vibrant and evolving destination for business and families to ensure a healthy way of life. We will provide a safe venue for signature events, nightlife, shopping and work." We are your neighbors, your friends and your co-workers. We are the business people and citizens of the borough. We are all volunteers, and your partners in helping Lansdale grow and thrive. In 2016 Discover Lansdale purchased the stately stone structure that had been our industrial gateway since the early 20th century and remains a Borough landmark. Each August Lansdale celebrates its establishment in 1872, honors its civic achievers, spotlights its artisans and craftspeople, cranks up the music and parties from morning till night -- and punctuates the day with fireworks! Each May Discover Lansdale publishes its Business Directory of stores, services, restaurants and more. Listings are free to Borough businesses (how to be listed), and we post it all online with a nifty interactive map! 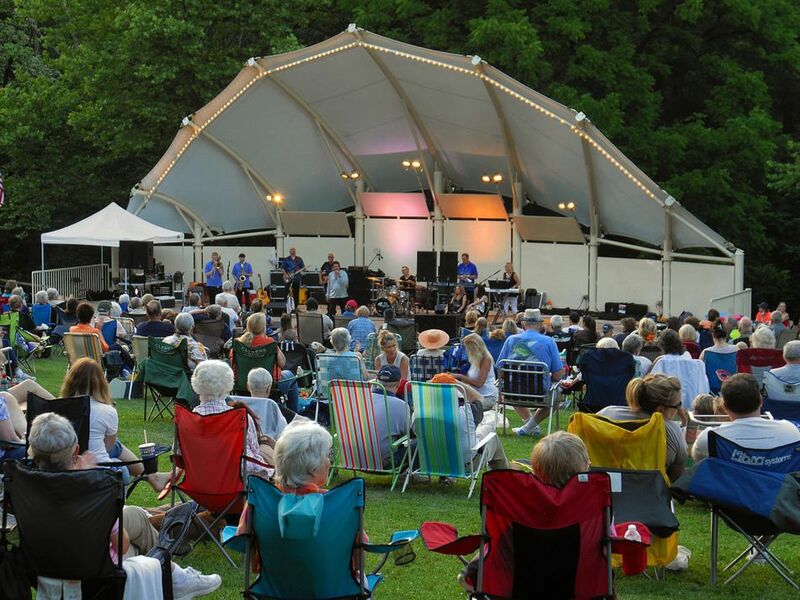 We organize many of Lansdale's top events, from First Fridays to Founders Day. We support local nonprofits with assitance and contributions. And we are active in the preservation of the borough's history. From May through December, you can Discover fun in the heart of town as we sponsor music, food, rides and other attractions the first Friday of each month. Each September we roll out our hot rods and roadsters, and relive those fabulous days of youth when we cruised the streets of Lansdale looking for an evening's entertainment. We'll have fun, fun, fun, till Daddy takes the T-Bird away! Four times a year -- including the big Business Directory issue in May -- we publish a guide to the town's events, issues and history. Pick up your free copy at most Borough offices, shops and businesses. Activities and attractions abound all year. Weekly concerts in Whites Road Park, a fabulous Farmers Market each Saturday, spring's International Festival and fall's Oktoberfest to benefit the Lansdale Public Library, Lansdale Day, The Lansdale Beer Fest, Cars Under the Lights, Bike Night ... the list goes on and on. Visit anytime, and you'll find things to do, places to shop and dine, and some of the friendliest people around. 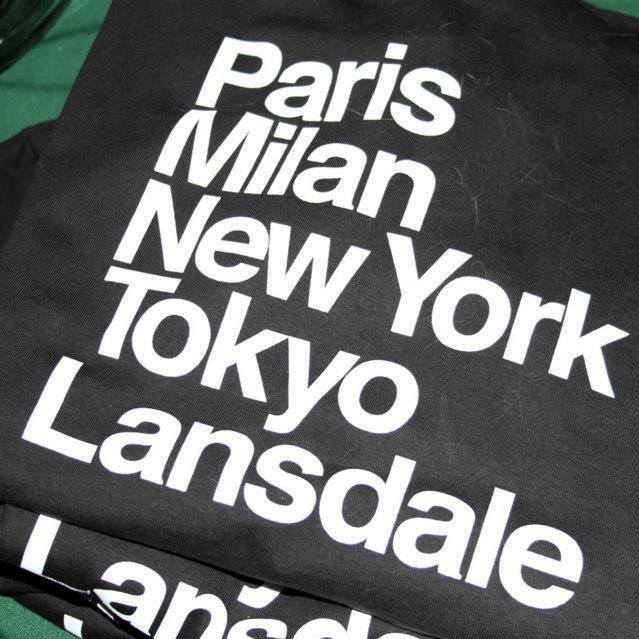 Our fabulous T shirts listing the great cities of the world -- Paris, Milan, New York, Tokyo and, of course, Lansdale (!) -- are available in many sizes and colors, including pink, green, blue and basic black, which is guaranteed to be appropriate for the most formal occasions. Or have your morning coffee in our Great Cities cup. All on sale at our events, or right here in our online store. 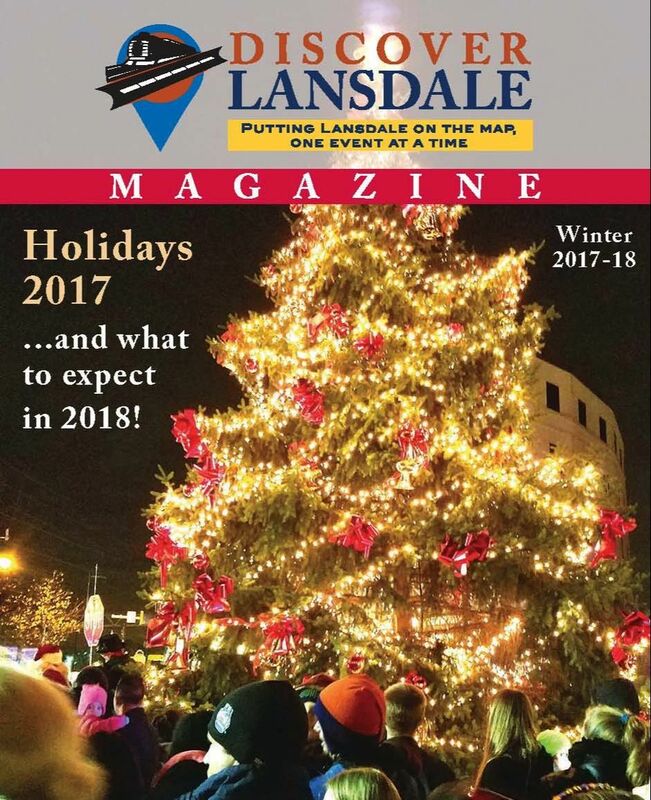 The Holiday issue of Discover Lansdale Magazine is out! It's your guide to what's happening in and around Lansdale for the holidays -- and what you can expect to happen in the borough in 2018, from the Madison Lansdale Station project to the Liberty Bell Trail. PLUS a history of our own misnamed Mardi Gras parade, and a guide to family holiday reading. You can find it, free, at many local establishments, plus Borough Hall and the Lansdale Library. And if you would like copies to distribute in your shop, restaurant or offices, just message us to let us know. CONGRATULATIONS TO OUR NOVEMBER ZOMBIE TRAIN SET RAFFLE WINNER!! 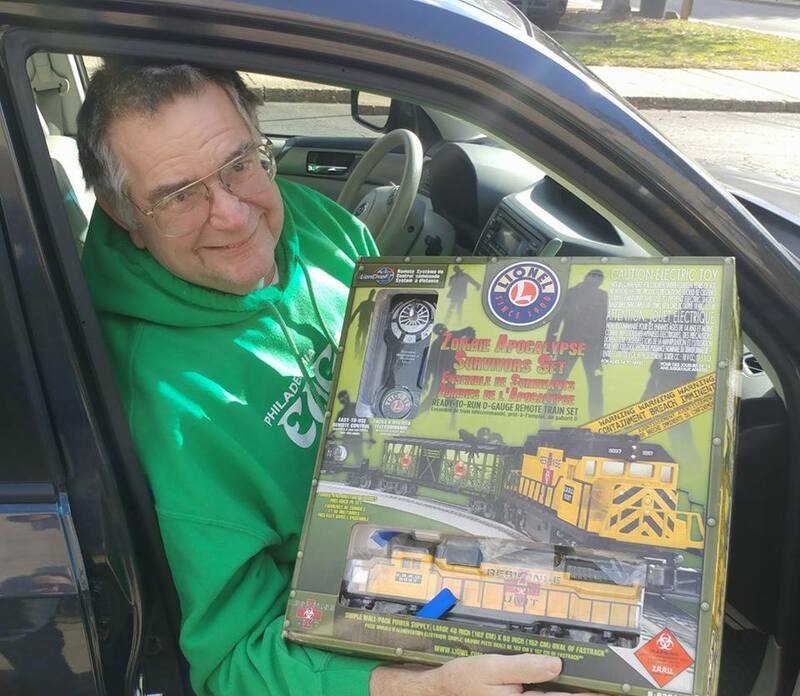 George, the gentleman above, was the very happy winner of the Lionel Zombie Apocalypse Survivors Train Set raffled off by Discover Lansdale in November. He picked up his award at Henning's Trains in Lansdale. All the proceeds from Discover Lansdale's raffles go to support our restoration project at the historic Reading Railroad Freight House at S. Broad and Vine Streets. We appreciate the generosity of Henning's Trains in donating the train set and helping out with a great community project. Watch for our next round of raffle prizes, coming in 2018. Check out this dynamic duo -- Santa! The Conductor on the Polar Express! Together again! 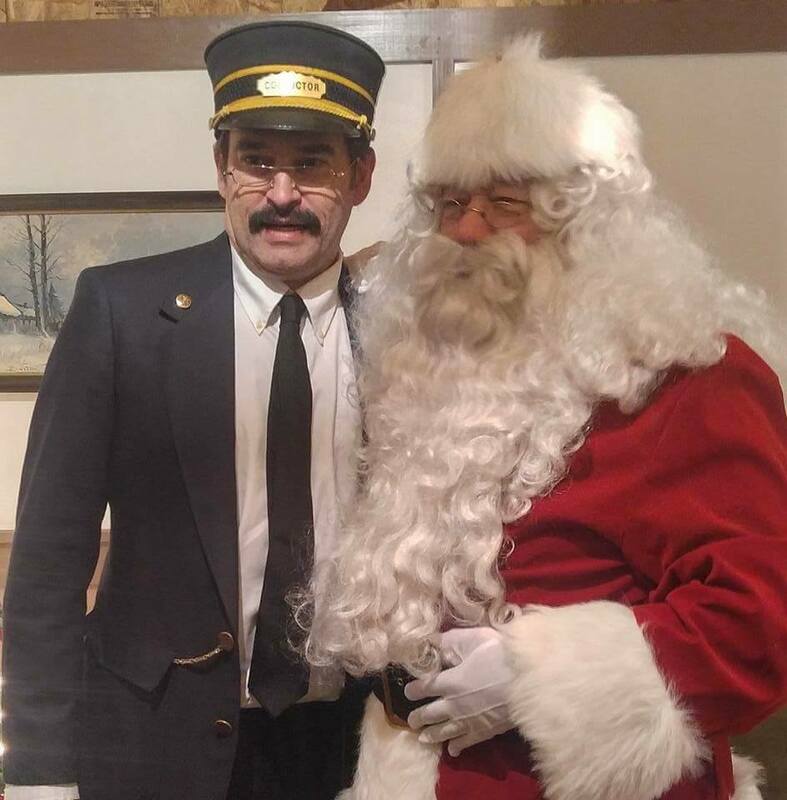 -- and you can visit them both in person as the borough's holiday festivities continue. The Conductor himself will conduct a reading of Chris Van Allsburg's revered children's novel on Friday, Dec. 8 at 6 p.m. at the Lansdale Library, followed by a viewing of the animated film at 7. You can follow all the area holiday events on our calendar page. And if your organization is having a public event, contact us and let us know so we can add it to our calendar. PLEASE WATCH THIS SPACE FOR FUTURE WORK DAYS AT THE FREIGHT HOUSE, AND UPDATES ON THE CONSTRUCTION. BELOW IS A PREVIOUS ANNOUNCEMENT. If you have tools, bring 'em. If you happen to have a jackhammer lying around the house, even better -- we are working on pulling up the concrete floor in the back of the Freight House. And if you're interested in buying some of the reclaimed lumber from the site, see the poster at the top of this column. You must wear closed toe shoes, if you have work boots please wear them. Safety goggles, we will have some but if you have please bring them. If you have ear protection bring it, we do have some extra ear plugs though. Inside is very loud if jack hammering is going on. TOOLS, Our tools and equipment are very limited so bringing work items would be very helpful and appreciated. Try to put your name on them. 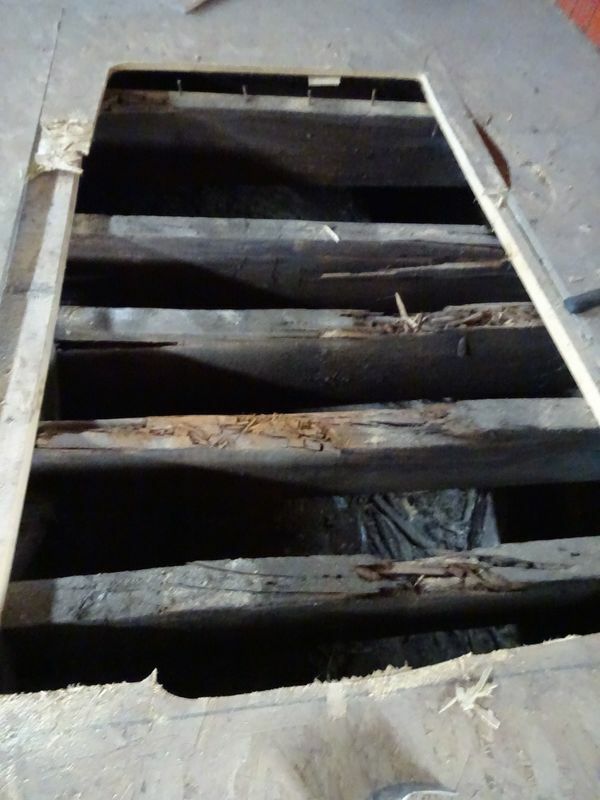 We need to continue to get the interior floor pulled up so the needed repairs can get to the floor joists underneath. Continue the disassembly of the exterior wood platform. Removal of vegetation from around the freight house. There will be a designated location to put the brush. Pickup all trash and rake out perimeter. A big part of the interior floor to be removed yet is a concrete slab. We are about 1/3 of the way through it. ANY help somebody can give with locating another jack hammer or something we can use to bust up concrete would be a BIG help a greatly appreciated. Please, ask around. Please note: This project is a construction work area, not intended for young children. Lumber Update: As mentioned we are offering much of the reclaimed lumber for sale (see attached). This 115 year old historic lumber is great for all sorts of projects. Makes great shelf boards or used for various furniture projects (tables, benches, etc.) and many rustic craft projects. 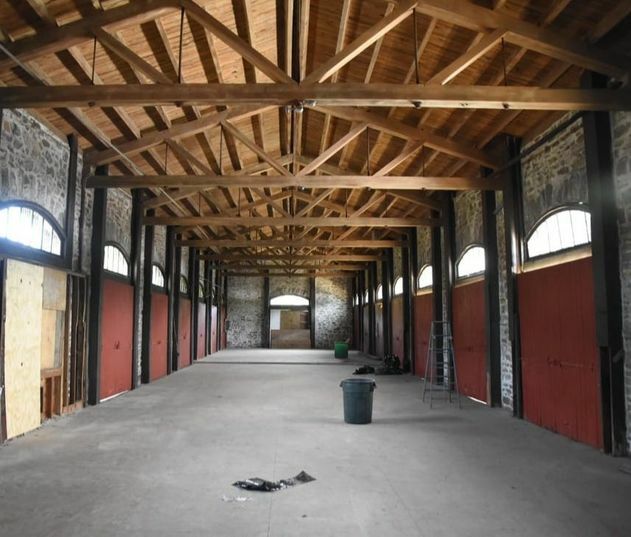 ALL of the money from the lumber sale will be added to the freight house restoration fund. Lumber will be available for sale during these work days. Own a piece of local history while supporting this great project! In mid-2016 Discover Lansdale, a nonprofit 501(c)(3) civic organization dedicated to improving the quality of life in the borough, purchased the stately stone structure to save it from the wrecking ball. The historic RR depot at the southern gateway to downtown Lansdale had fallen into disrepair after years of non-use. We hope to restore it to its former glory, and more — to make it a welcome center for the town, a showplace for the town’s history and growth, and a resource for the entire community for events and celebrations. Currently we are in the process of removing the flooring, assessing the physical condition of the building and the supports, and determining what repairs will be needed to ensure its structural integrity now and far into the future. This, along with other improvements to come, will be a multi-year effort and an expensive undertaking. Discover Lansdale is counting on you, and folks like you, to fund this effort. We hope you’ll be among the supporters helping to restore the Lansdale Freight Station as a town jewel. Whatever you can give would be greatly appreciated. To donate online, just click here and click the “Donate” button, or go to the How to Help page under the Freight Station tab. Or send your check to Discover Lansdale, PO Box 1112, Lansdale, PA 19446. Please note on the check that your donation is for the Freight House restoration. Every dollar you give will go towards that project. Your donations are tax-deductible; we will acknowledge donations via email, or if you wish a letter of acknowledgement sent, please click the box on the payment page to allow sharing of your contact information with Discover Lansdale. Thank You for giving back to our community. As always, Discover Lansdale appreciates your support. Please give us you first and last names. A valid email address is required. We do NOT sell or share this list!